My daughter threw a huge temper tantrum last night. No, it wasn't over a toy or anything else that would usually set off a child. She became upset because I told her that we didn't have time for our nightly read-aloud. 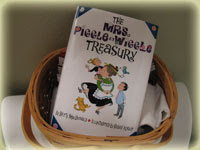 A week ago we began reading a chapter a night from The Mrs. Piggle Wiggle Treasury. I recently picked up copy of the book in the Borders Bargain section because I remembered liking the stories as a child and thought my daughter might also like to listen to them. Like is an understatement. She loves the stories and looks forward to the nightly dose, giggling over the silly cures. We've been strapped for time lately, so I have been reading a chapter to her while she takes her bath. Finding time to read aloud to kids, especially finding time to read a chapter book isn't exactly easy. My toddler son is too young to listen patiently to a chapter book so that makes trying to find some one-on-one reading time with my daughter even harder. Turns out that bath time works perfectly because she can play while also listening. Plus, it is right before bedtime so it's a great way for us both to wind down. She won't be needing Mrs. Piggle Wiggle's radish cure anytime soon! Lots of people read in the bathroom, whether in the bath or on the toilet. In fact, there is a whole series of books meant for bathroom reading -- those Uncle John's Bathroom Readers. Plus, don't forget the Reader's Digest. That's a standard in my parent's bathroom. In fact, in June some brave individuals even celebrate National Bathroom Reader Week. No, I'm not kidding. Look it up! Where am I going with this? Well, the problem with reading in our bathroom is that there is not really a good place to put the reading materials. I have a basket on top of the toilet that we use currently, but I'm a little concerned that the book might accidentally fall off and end up in the bowl. So here's what I'm wondering. 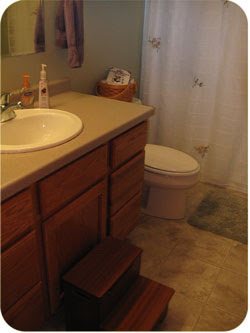 Why don't more bathroom vanities include a book holder or rack? This week, thanks to CSN stores, I'll be giving away a bathroom accessory to a lucky reader. Bet you can't guess what it is! Watch for the giveaway in a few days. That's great! I mean if you're going to have a tantrum, what better reason than not enough reading time. What a great way to spend time together reading! Not only is it hard to find a place for the reading materials, it's hard for mama to get comfy on the floor or the toilet or the counter . . . Not so comfortable! That's a great story and really where can't you read. I imagine books have been read in all sorts of crazy places. Has the story inspired or changed the bath play in any way? As for storage - I don't know I'd be a little careful if your little one is still at the posting in the toilet stage! They're really big about routine! My oldest has gotten pretty upset when we skip reading at night too.